In the United Church of Christ there is an understanding that all members are called by their baptism to ministry, and some are set a part for authorization for ministry. There are three authorizations for ministry: licensing, commissioning, and ordination. This process is designed to accompany members in their discernment process, whether for ordination, licensing or commissioning. It is intended to engage all partners in the discernment process, the Member in Discernment (MID), the local congregation, and the authorizing body (the Association or Conference acting on behalf of the Association). The process may also determine that a candidate’s calling is other than to authorize ministry. 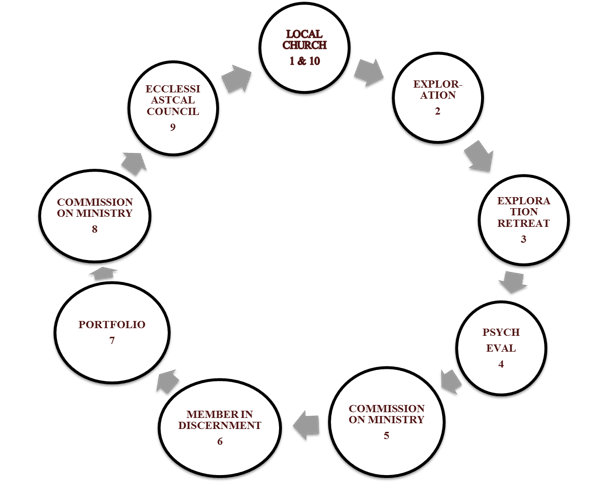 A person seeking to become a MID must be an active member of the local church through which he or she begins this process for a minimum of one year. The Covenant of Discernment between the candidate, his or her local church, and the Commission Ministry is to be a minimum of one year, and is not to exceed seven years. A person may be ordainable pending a call up to five years.